A Dutch Surinamese photographer and journalist has created a photo project of West Papuan political refugees living in exile to raise awareness of their plight. While in West Papua, his equipment was confiscated and returned only upon his departure, despite that it was not a visit for journalistic purposes. This clearly indicates that West Papua is still one of the most policed places on the planet. The author, Rohan Radheya is a Dutch Surinamese contract photographer and videojournalist. He is one of the very few press photographers from his country of origin covering stories on an international scale. With his work he hopes to reach out to the younger people in his community and to motivate them to explore their artistic side. Rohan is currently represented by Zumapress. In 1969, Indonesia took over West Papua with the now infamous Act of Free Choice, a mock referendum where West Papuans were forced to relinquish their independence through intimidation and threats. Today [22 April 2014], fifteen years after a democracy replaced President Suharto's dictatorship, West Papua is still one of the most policed places on the planet – with approximately 30,000 security personnel dealing with an indigenous population of around two million. Human rights records speak of atrocities, with disappearances and tortures happening on a daily basis. What is even more troubling is that some Indonesian military officers who committed and supervised tortures and genocide in East Timor are now serving in West Papua, and they are committing the same crimes. What triggered Indonesia’s annexation of West Papua are its rich natural resources. The US and other Western countries have huge investments in West Papua’s copper and gold. The US giant McMoran operates in Freeport, the largest mine in the world, making the company Indonesia’s largest taxpayer. For decades now, parts of West Papua and the Grassberg mine especially have been restricted to foreign journalists, making any assessment of the humanitarian crisis almost impossible. I first became interested in West Papua a year ago  when I had the chance to visit the capital Jayapura. When I arrived at the Sentani airport, I was told by the Indonesian immigration officers to go to the police station and pick up a surat jalan, or visiting permit, which is issued to all foreigners. At the police station, the head commissioner who was going through my passport noticed previous journalist visas from other countries. He asked me if I was a journalist. I thought it would be useless to deny it and I confirmed that indeed I was a journalist, but that for this particular trip I had no intention of working. What came after was most surprising. He quite simply Googled me and imposed upon me to leave my photographic gear at the police station. I could pick it up again on my way out of the country. 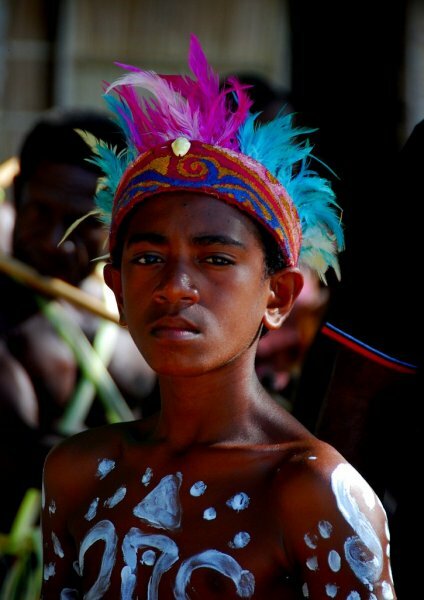 And so it is that I went through West Papua without a camera. I visited Wamena, Jayapura, and Vanimo. I met with key leaders of the OPM (Organisasi Papua Merdeka), the freedom movement for the liberation and independence of West Papua. When I came back to my home in the Netherlands, I looked for a way to bring forward the plea of West Papuans. I visited the International Criminal Court in The Hague and talked to Simon Sapioper, the President of the National Government of West Papua in exile. Simon sat down with me and told me about the horror of the 1998 Biak Massacre, where hundreds of West Papuans were chained and then dumped in the ocean by the notorious Indonesian Kopassus (Komando Pasukan Khusus or Special Forces Command). When their bodies washed ashore, the Indonesian authorities claimed they were victims of a tsunami that occurred one thousand miles away somewhere in Papua New Guinea. Simon hinted this could be a strong case for the International Criminal Court to start investigating crimes against humanity in West Papua. Fatou Bensouda, the head prosecutor of the ICC, told him to gather as much evidence as possible. I wanted to help and this is where my photos came into play. I needed strong pictures and I was inspired by the work of James Mackay and his project Abhaya, about political prisoners inside Burma. I was introduced to many West Papuan political refugees and started photographing each of them holding a board of a place in West Papua where war crimes have taken place. This is only a humble first step towards understanding, representing and offering exposure to West Papua’s independence struggle that would be strengthened if it gains an international awareness.